Software Inc is a management game of creating a small software house and culturing it until it festers into a corporate blight upon the digital kingdom. You need more money to develop your own software in the game. There are lots of method to get money in the game. However, if you want to make cheat in the game. Let’s look at the console and code list. How to Bring Up the Console? Go to settings and then key bindings. Scroll down to the bottom of the menu and you should see “Open Console”. Input whatever you want the key to be for opening the console. Clear – Clear the Console. Show_On_Error – Toggles whether to show the console when an error occurs. Show_Timestamp – Establishes whether or not to show the time stamp for each command. Help – shows a list of all commands available. Set_Font_Size – Sets the font size of the console. Show_Verbose – Sets true or false the property Verbose. ShowDebugLog – establishes whether or not to show Unity Debug Log. Exit or Quit – exits the game. Take_all_land – Claims the intire plots. Write_error – Shows all errors that has occured during this save. Toggle_Lights – Toggles whether lamps should allways be on. Spawn_Guest – Spawn a guest, that appears in the game for a receptionist. Toggle_Skyscrapers – Toggle whether skyscrapers should become see-through. Max_Employee_Stats – Maxes the states of all selected employees. 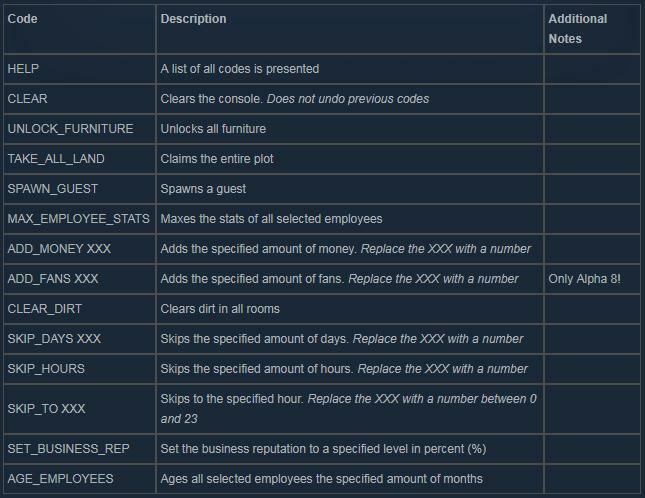 Open the “Staff management” menu and click “Select All” if you want the code to have an effect on all employees. Spawn_Car – Spawn the specified amount of cars, which park somwhere for a couple of minutes and drives off. Add_Money – Spawn the specified amount of money. Add_Funs – Spawn the specified amount of funs. Clear_dirt – clears dirt in all romms. Skip_Days – Skip the specified anount of days.This might freeze the game for a while. Skip_Hours – Skip the specified amount of hours. Skip_to – Skip the specified hour between 0 and 23. Age_Employees – Ages all selected employees the specified amount of month. Type 24 after the code if you want to add two years to the employee’s age. Type -24 after the code if you want to reduce the employee’s age by two years. Reload_Furniture – Reload all moded furniture with immediate effect. Furniture_Debug – Toggle whether to show build(red->cyan) and nav(green->pink) boundary, interaction points(blue) and snap points(yellow) of the selected furniture. Furniture_Thumbnail – generates a thumbnail for the specified furniture. Only works in the Main Menu. Export_Furniture_Bounds – Exports boundary information to the XML on the specified furniture. Flycam_Draw_Distance – The draw distance multiplier to use in first person mode. Between 1 and 10. Activate_Waypoint_Editor – Activates awaypoint animation system for first person mode. Press Backspace to add waypoint and Enter to play. Toggle_Ceiling -Toggles the generation of ceiling meshes of first person mode. Might need a reload and has performance impact. Reload_mod – Reloads the specified mod, but not for the currently running game. *some of the cheat codes may be only available for certain versions of the game. Don’t write the whole code. The CAPS is Doesn’t matter in the game. You can see any errors caused by someone else’s mode in the console.